How’s life treating Ryan Kayes during the first season of the Special TV show on Netflix? As we all know, the Nielsen ratings typically play a big role in determining whether a TV show like Special is cancelled or renewed for season two. Netflix and other streaming platforms, however, collect their own data. If you’ve been watching this TV series, we’d love to know how you feel about the Special season one episodes. We invite you to rate them for us here. 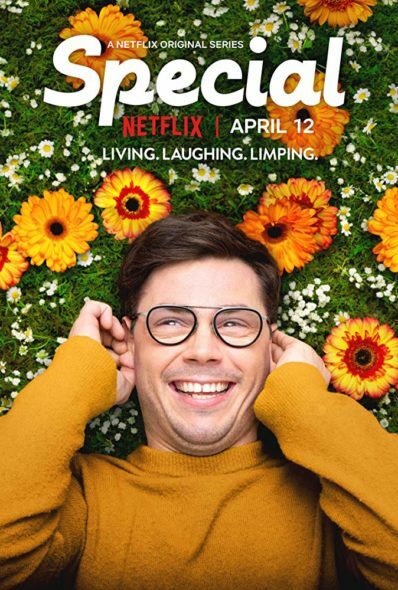 A Netflix short-form scripted comedy, Special stars Ryan O’Connell, Jessica Hecht, Punam Patel, Marla Mindelle, Augustus Prew, and Patrick Fabian. In addition to starring as Ryan Kayes, O’Connell also created and writes the series, which is based on his memoir, I’m Special: And Other Lies We Tell Ourselves. It centers on Ryan, a gay writer living with mild cerebral palsy, who decides to tell his new co-workers that a car accident is responsible for his physical condition. At first, he feels liberated by hiding his disabled status in the closet, but then starts to feel ensnared in a trap of his own making.